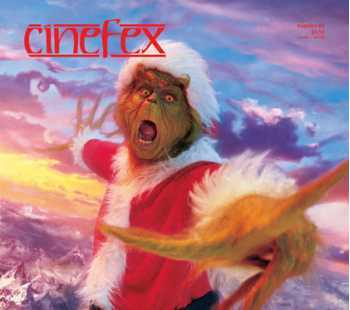 For his live-action version of the beloved Dr. Seuss story, How the Grinch Stole Christmas, director Ron Howard created the town of Whoville and nearby Mount Crumpit on massive soundstages at Universal, then relied upon makeup maestro Rick Baker to transform actor Jim Carrey and a huge cast of supporting actors and extras into the fictional Grinch and his Who neighbors. Adding visual dazzle to the proceedings were special effects coordinator Allen Hall, in charge of on-set gags, and Digital Domain, whose virtual set extensions and other effects lent style and verisimilitude to the fantasy world. In Red Planet, astronauts from a dying earth encounter dire obstacles as they investigate failing terraformation experiments designed to render Mars suitable for human colonization. Faced with daunting challenges of its own — including a competing project and a ballooning effects slate that threatened to top out at nearly a thousand shots — Warner Brothers called upon visual effects supervisor Jeffrey A. Okun to oversee the massive effects effort. Also recruited were a dozen effects vendors, delivering everything from space footage and zero-gravity effects to Martian landscapes and a CG robot performance.